The Madagascan Hoopoe is endemic to Madagascar where it is widespread in N, W and S, but it is rare or absent from most of E. It frequents both natural forest areas and human-modified habitats. 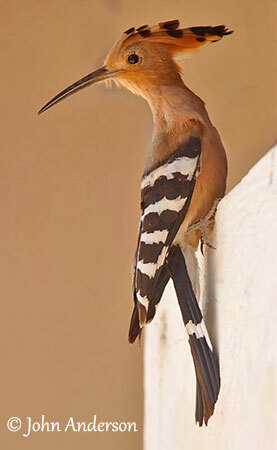 It was formerly a subspecies of the Eurasian Hoopoe, but it is now a full species. 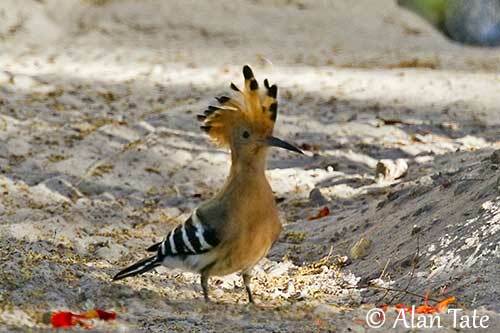 It differs by its low trill, very different from other hoopoe’s calls. It feeds on various insects and larvae caught on the ground by walking and probing into the leaf-litter. It nests in natural cavities, usually in tree. The Madagascan Hoopoe is common and widespread in degraded habitats and the species is not currently threatened. 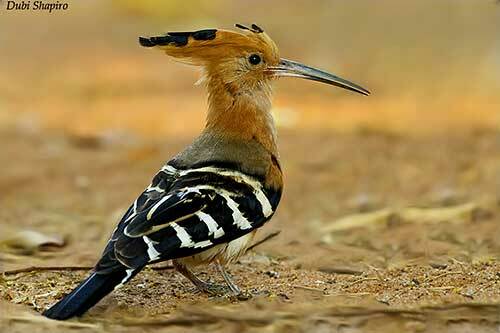 The Madagascan Hoopoe is larger than the Eurasian Hoopoe and it has thicker bill. It is greyer and darker above, with dark greyish mantle. The upper wingbar is broader. The adult male has orange-rufous head with conspicuous black tips to crest feathers. The mantle is dull grey. Upperwings and rest of upperparts are black with broad white bars, sometimes washed orange. The primary flight-feathers show broad white bar and the secondaries have white subterminal bars. Uppertail-coverts and tail are black, the later with a broad white band across the centre. The underparts are buffy-orange, paler on breast, belly and undertail-coverts that may be almost white. The thick bill is greyish with pinkish base. The eyes are brown. Legs and feet are dark grey. The female has similar plumage but she is duller than male. 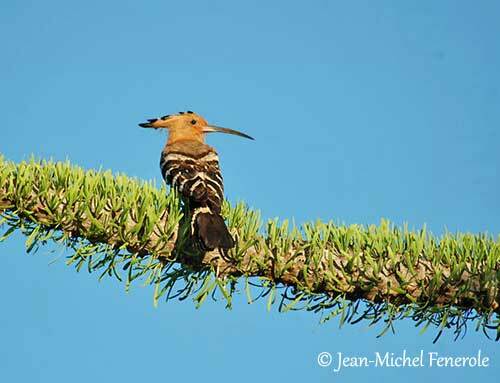 The Madagascan Hoopoe is common in N, W and S Madagascar, but it is rare or absent from the east. It is locally abundant on C Plateau and the population is increasing across E due to forest clearance creating new suitable habitats. The Madagascan Hoopoe is found in dry open country with scattered trees, wooded plains, light understorey, tree-bordered cultivated areas, savanna, plantations and lakes with open shores. It can be seen up to 1,500 metres of elevation, but it usually occurs mainly below 1,000 metres. The Madagascan Hoopoe differs from other Upupidae by its voice. The male utters a resonant rolling phrases repeated at short intervals. This call is used in territorial behaviour and is described as resonant purr or cooing trill “rrrroow” somewhat similar to dove’s call. While calling, the male raises and vibrates head, neck and body. Pair members give harsh growl “aaaaahhhrrr” to communicate. A repeated, low, hissing “chrrshhh” is probably given if the birds are threatened. 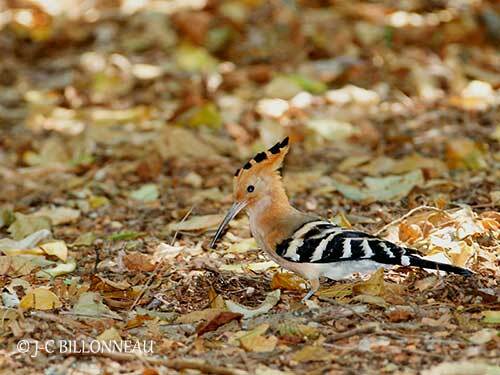 The Madagascan Hoopoe feeds on insects and larvae. It forages in forest clearings and brushland, and on open ground. It walks with quick steps while bobbing the head. It picks food items from the surface, but it also probes into earth, dung and leaf-litter to find worms and larvae, and also searches for food in cavities among stones. The Madagascan Hoopoe is resident on Madagascar. The flight is undulating with 4-5 beats interspersed with glides on closed wings. During the flight, the contrasted black-and-white pattern is conspicuous. The laying occurs between August and December, with peak in October/November. 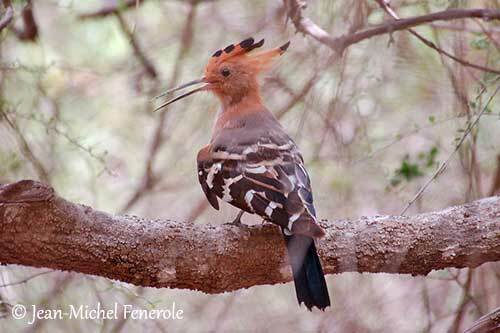 The Madagascan Hoopoe nests in natural cavities, usually a hole in tree, 1,5/3 metres above the ground. But it may use rocky cavities too, but this type of site needs confirmation. The cavity is lined with some leaf stems. The site can be an isolated tree near wooded areas, or in open wood and brush area. The female lays up to 6 bluish-white or pale greyish-blue eggs with sometimes some brown markings. The incubation is probably by the female alone, but she is fed by the male during this period. Incubation and fledging periods are unknown, but generally in Upupidae, the incubation lasts 15-18 days and the young fledge between 25 and 30 days after hatching. They are fed by both parents. The Madagascan Hoopoe is common and widespread in most of range. The population is suspected to be increasing on C Plateau and in E, following deforestation. The species is not globally threatened, and currently evaluated as Least Concern. 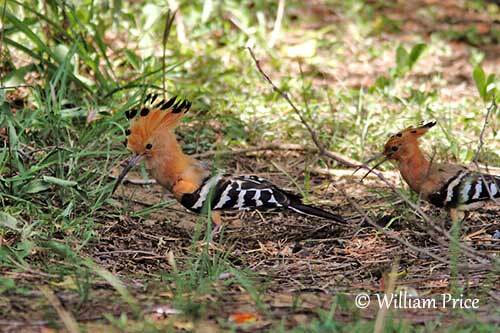 The Madagascan Hoopoe forms monogamous pair-bonds. It is territorial and the male gives advertising calls from perches in trees. The courtship behaviour is typical of Upupidae. The male chases the female and then, in the immediate pre-breeding period, courtship feeding begins and occurs on the ground, accompanied by crest raising and soft calls. Next, the male searches for the nest-site. Mating may occur on the ground or on large branch, but usually near the nest-site.